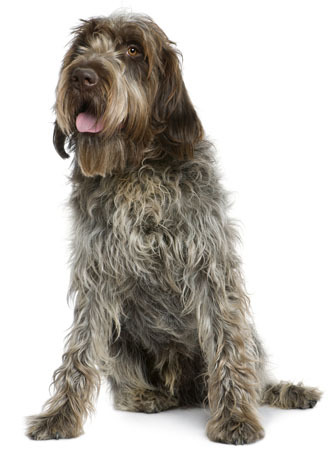 Learn about the temperament and personality of the Wirehaired Pointing Griffon. Discover what he's like to live with, his traits and characteristics and how he generally behaves. And look at lots of Wirehaired Pointing Griffon photos. The Wirehaired Pointing Griffon is a skilled hunting dog and an excellent family pet. They are people-oriented and thrive on human companionship. If lonely, they can become destructive. These are highly trainable dogs with quick and intelligent minds. You want those minds working for you, not against you. On occasion, they can be a bit willful. These are active dogs who need rigorous daily exercise. They are athletic and agile and make great hiking and jogging partners. They also love to swim and chase tennis balls. Basically, they love to do anything outside with their masters. These are fun-loving dogs who are usually friendly with strangers, other dogs, and other pets. They are gentle and affectionate with children, but keep in mind that all dog/child interactions should be supervised. The Wirehaired Pointing Griffon makes a good watchdog as he is naturally protective. Most will sound the alarm if they hear, see, or smell something amiss. These dogs are hopelessly devoted to family. They are cooperative, affectionate, and willing to please. The Wirehaired Pointing Griffon is moderately easy to train. He learns new commands at the average rate. He is neither difficult nor easy to train. The Wirehaired Pointing Griffon sheds a fair amount of hair. You'll find hair stuck to your couch, carpets, clothes and everything else in your home.